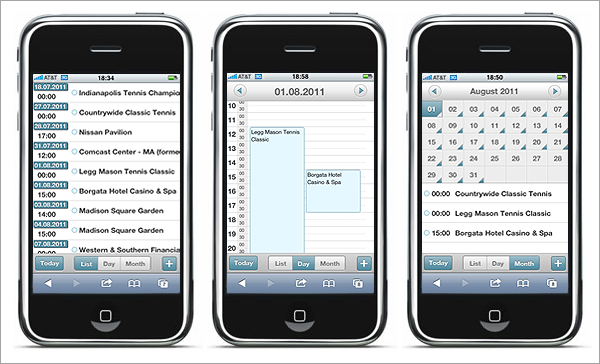 dhtmlxScheduler 3.0 comes with a mobile version of the scheduler that can be used in web apps for touchscreen phones and tablets. Although it’s a separate solution, the server side of the mobile scheduler is compatible with dhtmlxScheduler for desktop browsers. The mobile version uses the similar principles, but has a slightly different set of events and templates. dhtmlxScheduler 3.0 supports Outlook-like way to display the agenda in a Week View. The whole week is visible and work days take up more space than the weekend. 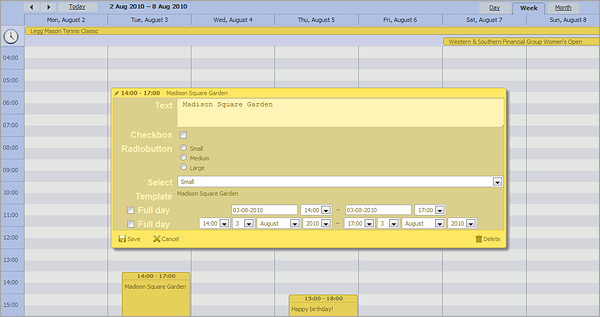 The new version of dhtmlxScheduler offers lightbox form optimized for small screen resolution used in netbooks. Now end-users can see a popup box with event details on any screen size without scrolling the page. We have also satisfied developers requirements and made a lightbox form draggable. With the new version of the event calendar, you can define what days and hours are available for events creation and make other days and hours disabled. Users will be able to create events only in specific time frames (for example, only on work days or work hours). We have also added the ability to display multiline header in Timeline View. You can now show two scales in the header (for example, like days and hours scales on the screenshot below). If you have multiple events registered in the same time slot, dhtmlxScheduler 3.0 allows you to show them in a cascade view. This is a great way to display overlapping events. In addition to multiple bug fixes, there are other small improvements in version 3.0 that you may find useful. For example, we have included the “glossy” skin to the dhtmlxScheduler package and added the ability to indicate the current time on the calendar (displayed as a red dotted line). dhtmlxScheduler 3.0 also allows a ridiculously easy way to define colors of events. Just set the “color” or “textColor” attribute in XML or JSON and related event will be colored accordingly. Another enhancement is that multiday events, which are displayed on the top of the calendar in Day and Week Views, now stay on top when the user scrolls the page down. We hope you’ll enjoy working with the new version of dhtmlxScheduler. Visit the Downloads page to get the updated package and try the new cool features now. I have been using your scheduler now for the last 8 months. One thing that is very frustrating is that if the timeslots are 30minutes long and the appointment is also 30minustes long the appointment display actually closes or fills 2 timeslot lines (therefore it fills an hour on the calender) – this creates confusion and the appointments falls behind each other. Is there any way to prevent this? Is there any way that one can put the name of the event next to the time so that it only fills one timeslot line? > name of the event next to the time so that it only fills one timeslot line? Can you secure the scheduler where not everyone can get into the scheduler? Jeff, dhtmlxScheduler is just an HTML page, so you can use the same solutions, as you use normally for HTML pages – add some page with login before showing the scheduler or use .htaccess with native http access rights configuration. What is really needed for multi-users is having the time(12:00) over the cell hi-light when the cursor is over the cell. when John is at far right on screen its hard to see what time you are clicking on when the time is far left screen.. Strongly needed as well. Have you tried dragging an event in month tab. If you try to drag at 1st of month and days are FULL you CANNOT drag event to end of month.. you cant see it!! Thank you very much for your suggestions. We’ll consider adding these features in the next version of dhtmlxScheduler. Samuel, do you use the mobile version of dhtmlxScheduler? Is this a new version of the wordpress eventcalendar/scheduler plugin? No, we haven’t updated the scheduler plugins for WP and Joomla to version 3.0 yet. The new version 3.0 looks really good, specially the mobile support. As I’m using the wordpress plugin, it would be nice, if that would be updated. I know Eric already mentioned it, but is there anything planned? As at the moment the sheduler doesnt fit in the iphone….. Unfortunately, we do not plan to upgrade Scheduler for WP to version 3.0 in the near future. You can use the original version of the Scheduler, if needed. I facing problem regarding dhtmlx mobile scheduler. it works with month and list view but doesn’t display events in day view (Or displays it on wrong time). I just installed 2.3 via joomla plug-in and absolutely love it. However, it seems buggy with the recurring date feature (creates new multiday events that bar up the calendar). It also seems to have trouble saving from different browser brands. Suggestions? Does 3.0 address this? How can install 3.0 in joomla? The scheduler plugin will be updated to v.3.0 in the near future, and it will support features offered by dhtmlxScheduler 3.0. Please provide more details on the issues with recurring events and differences in browsers (scheduler is cross-browser product and it should have the same look in all major browsers). It would be useful to have a link to your scheduler page. Are you planning on implementing a multiple resource view in week mode ie multiple people on the screen with 1 week shown side by side? Nope. In case of mobile UI – there is just not enough place to show such info. Is there any easy way to make the wordpress version of dhtmlx scheduler recognize when it is on a mobile device and switch to the mobile version?